Organized by Academic Forum (Society for the advancement of Education, Research and Science). The areas covered seem to be interrelated and enriching one another at the foundation level during the last decade or so. The papers in this volume display a wide panorama of connections of Discrete Mathematics with other fields. These papers represent the myriad and diverse range of topics within the field - in theory and applications - and disseminate important new results. Treatment of numerous and wide-ranging applications make this resource important for academic and practising researchers working in a variety of topics in Discrete Mathematics and related areas. 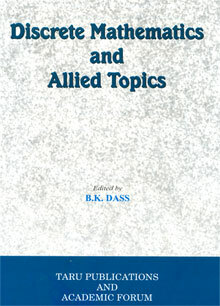 The contributors in this volume are : U. Aparajita, S. Arumugam, N. Bhattacharjee, M. Bidkham, A. Cambini, H. Chandrashekhar, K. S. Chang, K. K. Das, K. K. Dewan, M. Elia, J. C. Interlando, Md. A. U. Khan, S. Kim, K. Krithivasan, B. K. Mangaraj, L. Martein, A. Maturo, A. Mishra, R. C. Mittal, G. Morgari, S. Mukhopadhyay, M. Nagaraj, S. K. Pal, Jr. R. Palazzo, V. Radhakrishnan, R. Ratan, M. J. Ryan, P. K. Saxena, H. M. Serag, M. K. Singh, O. Steila, J. S. Suseela, T. C. Venkatesan, I. Yoo. Orders may be placed with remittance by cheque/draft favouring TARU - Books & Journals.Prompt supply by AIRMAIL at our cost. No other charges. Proforma invoice can also be sent to facilitate payment at your end. Taru Publications is one of the leading exporters, Suppliers, Wholesalers and Distributors of all kind of Indian Books.